Counseling and Therapy in Video provides an invaluable firsthand look at the realities of working with clients and the challenges associated with putting theoretical concepts into practice. This series contains more than 2,400 hours of footage from actual therapy sessions, training videos, and reenactments conducted by renowned counseling professionals. The content is broken into 4 main sections. 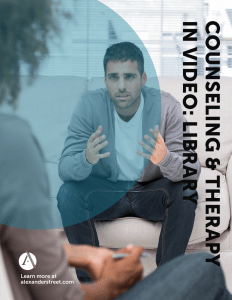 Counseling & Therapy in Video: Classic contains foundational videos from 1985-2010 that cover recent history of practices. Counseling & Therapy in Video: Volume III includes films about the founders of theory and the progression of practices to today. Counseling & Therapy in Video: Volume IV addresses new population groups, contemporary approaches, and issues. Counseling & Therapy in Video: Volume V, The Symptom Media Collection provides comprehensive DSM-5® / ICD-10 coverage has built-in assessments to assess comprehension. Counseling and Therapy in Video provides an array of features to enhance teaching and learning. The collection is indexed to meet the specific search needs of counseling faculty and students. Search and browse by client age, diagnosis, therapy type, counselor gender, and much more. View a full overview of all of the features on the Counseling and Therapy in Video interface here.